*In order to make things easier for me, I shall refer to the members of the Royal Family and then-Prime Minister Tony Blair by their titles. Her Majesty Queen Elizabeth II will be HM, His Royal Highness (HRH) Phillip, Duke of Edinburgh will simply by Edinburgh, HRH Charles, Prince of Wales will be Wales, Her Majesty Queen Elizabeth the Queen Mother will be QM, and Mr. Blair will be PM. Diana will remain Diana. I think that will save time. The British National Anthem, God Save The Queen, asks God to "send her victorious/happy and glorious". In the week following the death of Diana, Princess of Wales, it's a safe bet that she was none of the above. In fact, it was an extremely trying time for her, and the actions of the House of Windsor inadvertently brought about one of the greatest crises of Her Majesty's reign, and perhaps the worst since the Abdication of Edward VIII, Duke of Windsor. The Queen chronicles that one week in the more than half century of her rule, one week where she found herself in a world that came close to smashing her to bits. We begin on May 7, 1997 when Labour Party leader Tony Blair (Michael Sheen) is swept into power and pays a call to Buckingham Palace. As the British Constitution dictates, he goes to HM (Dame Helen Mirren) so that she can request that he form a government in her name. While Blair is deferential to HM, his wife Cherie (Helen McCrory) doesn't try hard to mask her contempt for the Monarchy to HM's face. Their first meeting is short, cut off by news HM's aide Sir Robin Janvrin (Roger Allam) whispers to her. Though it's not stated what the news is, the First Lady suggests it has to do with Diana. Diana: always seen in archival footage, like a shadow that falls perpetually over HM and Court. It's three months into the PM's tenure when, on August 30, Diana dies in a car accident in Paris. The news disturbs the Windsors, especially Wales (Alex Jennings). He is the only one of the Windsors who is sensible and logical when it comes to what should be done with Diana's remains. HM and Edinburgh (James Cromwell), though shocked and slightly irritated respectively by the events, are bound by protocol and tradition to do much. This view that the Windsors should do nothing is echoed by QM (Sylvia Sims). Reluctantly, HM agrees to allow Wales to use a royal plane to collect her body and return her to Britain. Back in London, Blair's aide Alastair Campbell (Mark Bazeley), who is hostile to HM, is trying to use Diana's death to Blair's advantage: attaching the memory of the beloved Princess to the new PM. HM, in her splendid isolation in her Scottish estate of Balmoral, believes the best thing to do is to say nothing, do nothing, believing this is a private matter between the Spencers (Diana's family) and the Windsors (as the mother of her grandchildren who are mentioned but seen on screen). She also doesn't believe there should be a public funeral, merely a memorial service two months after a private one. Blair realizes that this is an impossibility given her immense popularity, and Sir Robin soon gets a hint of just how much Diana was loved when he sees his own staff crying after the PM's remarks about Diana being "the people's princess". As the week progresses, the stiff-upper lip reaction of the Windsors is met with hostility by the general public, egged on by an eager press and with exasperation from the government. Wales does his best to steer HM to Blair's views (partially, the film suggests, to save himself from the crowd's hostility, even potential violence), but HM and the rest of the family continue to believe that the public will soon calm down and come to their senses. As the public demands more and more (flags at half-staff over Buckingham Palace, the Windsors to return to London, a virtual state funeral), HM continues to now stubbornly hold on to her ideas of how the British should behave and how her subjects expect Her to behave (we also get the strong suggestion that HM is extremely concerned over her grandchildren). Eventually, HM realizes that the situation is now out of control and that a woman who built her life on tradition must now bend to the popular mood, much to her horror and honest disbelief. The Queen is rare in that it is a historic picture which almost all the audience knows the story (as opposed to something like That Hamilton Woman or JFK). This gives the audience a unique perspective where we get to see the inside story, or at least as written by Peter Morgan and directed by Stephen Frears. The script is intelligent in the use of subtext, when things are spoken but in reality stand for something else not being said out loud. 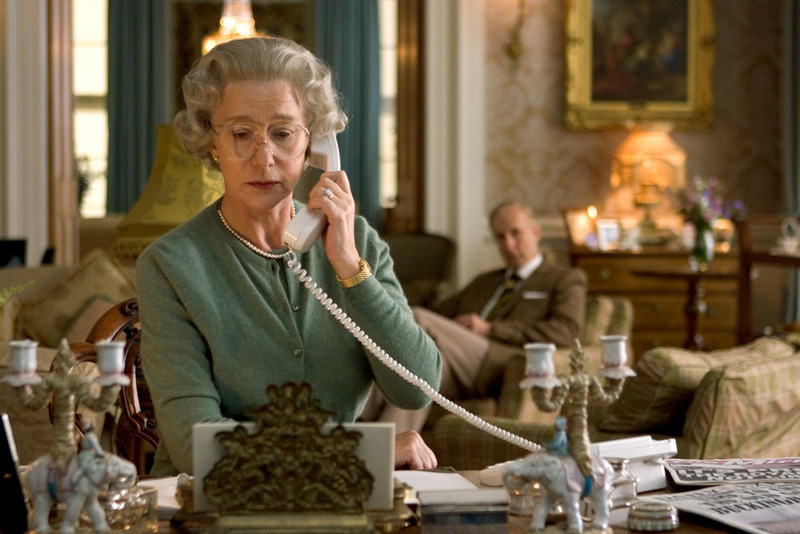 Take the scene where Wales and HM are driving in Balmoral. Wales goes on about whatever Diana's faults she was a good mother: affectionate and caring, suggesting HM wasn't. Later on, when Edinburgh complains that Diana should have tolerated Wales having a mistress by saying something to the effect that all wives should 'toe the line', HM merely looks at him and asks, "Do they? ", subtly suggesting that Edinburgh himself has been unfaithful. On the government side, there is an evolution of Blair from the great modernizer to someone who begins to feel sympathy for HM as his advisers and the public begin to go overboard in their loathing for HM for not showing the intense mourning that they feel. The performances are all without exception perfect. This is due to the ability of Frears, who brought an excellent cast and directed them brilliantly. The only American in the cast (Cromwell) captures the irritability and disdain of Edinburgh, a man who has always been a certain way and will remain that way regardless of how the winds change. Edinburgh is a man who has a set view of how Monarchy works, and while he rages like the best of them he has moments of gentleness, as when he addresses his wife/sovereign as "cabbage". It would be difficult to portray a 97-year-old woman with complete accuracy, but Sims creates a bright QM who is genuinely puzzled and hurt that Diana's funeral is going to be based on her own. On the government side, Bazeley's Campbell is a shrewd though opportunistic Communication Director who soon begins to speak like the press. If we go to the leads, we find they are the virtual doppelgangers of their real-life counterparts. Sheen, who had previously played Blair on British television in The Deal, captures Blair's mixture of shrewdness and insecurity. He not only sounds like Blair but manages to look extremely like him, down to what QM accurately described as his "Cheshire cat grin". Near the end of the film, Blair rails against Campbell, defending HM in an impassioned tirade that points out all the good she's done and how now everyone is basically going after an old woman who doesn't cry on cue. It's a brilliant performance which was oddly ignored at Oscar time. At the heart of The Queen is the Queen herself, and in Dame Helen she is a woman bound by tradition who realizes that the world she grew up in and has operated on has disappeared. Mirren never makes her into a parody, but instead someone who is overwhelmed by the situation, who believes people should behave a certain way but who comes to realize that to save the Monarchy she must do things she might not want to do but has to. Near the end of the film, when HM finally returns to London, she asks a small girl if she'd like her to put the flowers the child has in front of the Palace gates. "No thank you," the girl replies. At first, we see as much hurt and rejection that HM can show in public, but when the girl tells her, "These are for YOU," we see the relief and joy on her face, and when she gives the speech about Diana on television, it is almost like watching the real thing. Even on the technical side, things are excellent. Lucia Zucchetti's editing mixes seamlessly archival footage of Diana into the film where you don't notice that it wasn't made for the film. Alexandre Desplat's score is elegant, setting the mood while never overwhelming the story. It's a case of unintended consequences that Peter Morgan's script had the opposite effect to the one the author intended. Morgan hates HM and the Court. If The Queen was meant as a hatchet job (and I believe it was), instead what appeared on screen was a sympathetic portrait of a woman who has tried to the right but finds herself being hated with fervor. 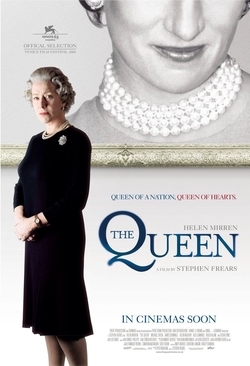 If I would fault anything in The Queen, it's the overt symbolism in it. The story of HM is put in parallel to that of an Imperial stag. This is a creature being hunted down, eventually shot and beheaded by a commoner. Sound familiar? That kind of symbolism isn't my cup of tea and it was far too obvious, striking an odd note given how much subtext there was. However, this is a minor point in an otherwise excellent film. The Queen tells a story of how tradition collides with modernity, but if you think about it, who has ultimately won? Blair is no longer in power, Diana is now a cult figure but her memory is not as strong as it was in 1997, yet it's Her Majesty who still reigns. As much as Morgan may detest the idea, Elizabeth II will in all likelihood be his monarch until death (his or hers, whichever comes first). Some good has come from this traumatic week in her reign: HM has become more personable in public. As any good monarch has done, she's responded to the wishes of her people, who now live in Cool Britannia. Perhaps now she is victorious, happy, and glorious.